Jacques Pepin: More Fast Food My Way | KQED copyright © 2008 Greg Habiby. 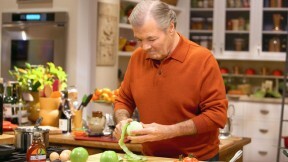 Jacques Pépin, one of today’s most respected chefs and teachers, returns to public television with home-cooked meals on Jacques Pépin: More Fast Food My Way, the sequel to his inspiring last series. His fans, including many of the world’s best chefs, new culinary stars, and home viewers, know him for his unsurpassed skills and gastronomic knowledge, setting him apart from other television cooks. Now in his seventies, Jacques establishes his expertise once again with straightforward, delicious, and quick recipes for everything from a simple snack to an elegant dinner. Using readily available fresh foods, supermarket staples, and solid, uncomplicated techniques, Jacques proves that healthy, tasty meals can be on the table faster than a trip a to the local fast food counter! Each episode of More Fast Food My Way begins with a super-fast, super-easy, minute recipe, such as Croque Monsieur Tidbits, an instant Red Pepper Dip or Butter Bean Canapes. Jacques shares 4 or more dishes per show, along with valuable quick tips and techniques, while tossing in various stories from his life as the ground-breaking director of research and development at Howard Johnson Company, chef to three French heads of state, and close friend of Julia Child. For several episodes, Jacques is joined once again by his daughter Claudine, a favorite kitchen apprentice. Together, they recreate many of their favorite home dishes, influenced by his wife Gloria’s Puerto Rican heritage and by his granddaughter Shorey. With his skill as a master chef, Jacques spends “one on one” time with his viewers and daughter, offering such useful tips as how to peel and enjoy broccoli stems (often discarded), or how to cook a whole chicken in 40 minutes by flattening the bird.